The first step in data mining images is to create a distance measure for two images. In the intro to data mining images, we called this distance measure the “black box.” This post will cover how to create distance measures based on time series analysis. This technique is great for comparing objects with a constant, rigid shape. For example, it will work well on classifying images of skulls, but not on images of people. Skulls always have the same shape, whereas a person might be walking, standing, sitting, or curled into a ball. 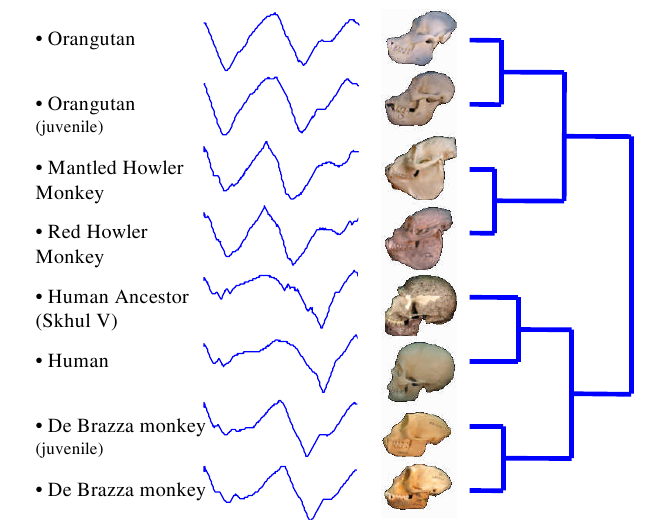 By the end of this post, you should understand how to compare these hominid skulls from UC Riverside  using radial scanning and dynamic time warping. We have our choice of several algorithms for each step. In the rest of this post, we will look at two algorithms for converting images into time series: radial scanning and linear scanning. 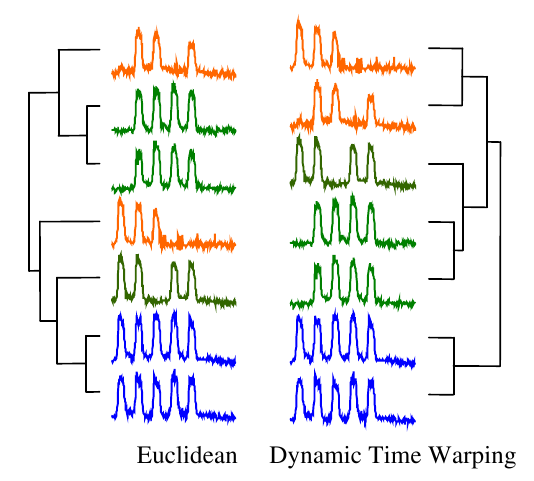 Then, we will look at two algorithms for measuring the distance between time series: Euclidean distance and dynamic time warping. We will conclude by looking at the types of problems time series analysis handles best and worst. First we find the skull’s outline. Then we find the distance from the center of the skull to each point on the skull’s outline (B). Finally, we plot those distances as a time series (C). 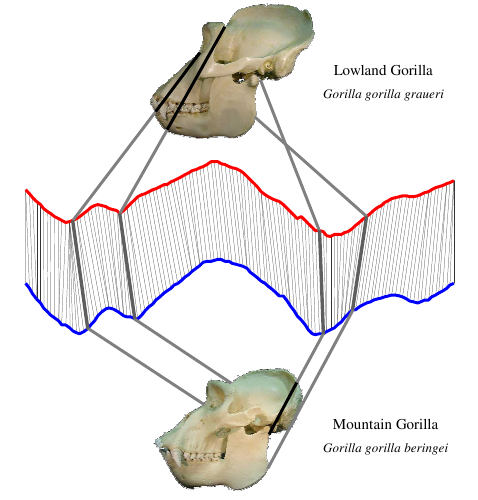 The lines connecting the skull to the graph show where that point on the skull maps to the time series below. In this case, we started at the skull’s mouth and went clockwise. Take a careful look at these skulls and their time series. Make sure you can spot the differences in the time series between each grouping. Don’t worry yet about how the groupings were made. Right now, just get a feel for how a shape can be converted into a time series. The labeled points on the leaf at left correspond to the labeled positions on the time series at right. Radial scanning is a popular technique for leaf classification because every species of plant has a characteristic leaf shape. Each leaf will be unique, but the pattern of peaks and valleys in the resulting time series should be similar if the species of plant is the same. We can already tell that the graphs created by the skulls and the leaf look very different to the human eye. This is a good sign that radial scanning captures important information about the objects shape that we will be able to use in the comparison step. Then, we remove the tilt from the image. All of Washington’s writing has a fairly constant tilt, so this process is easy to automate. 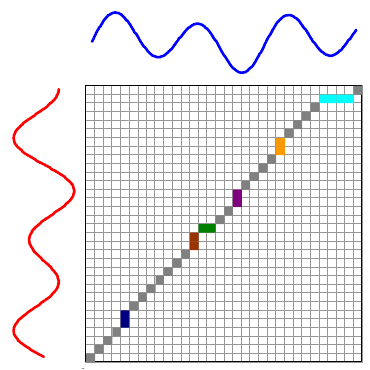 To create this time series, we start at the left of the image and consider each column of pixels in turn. The value at each “time” is just the number of dark pixels in that column. If you look closely at the time series, you should be able to tell where each bump corresponds to a specific letter. Some letters, like the “d” get two bumps in the time series because they have two areas with a high concentration of dark pixels. We could have constructed the time series in other ways as well. For example, we could have counted the number of pixels from the top of the column to the first dark pixel. This would have created an outline of the top of the word. We simply have to consider our application carefully and decide which method will work the best. We now have two simple methods for creating time series from images. These are the simplest and most common methods, but the only ones. WARP  and Beam Angle Statistics  are two examples of other methods. Which is best depends—as always—on the specific application. Now that we can create the time series, let’s figure out how to compare them. 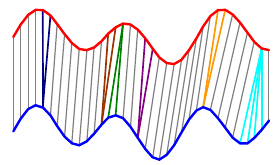 where \(red_i\) is the height of the red series at “time” \(i\), \(blue_i\) is the height of the blue series at “time” \(i\), and \(N\) is the length of the time series. This is a simple and fast calculation, running in time \(O(N)\). In this case, each of the humps in the blue series is matched with a hump in the red series, and all the flat areas are paired together. 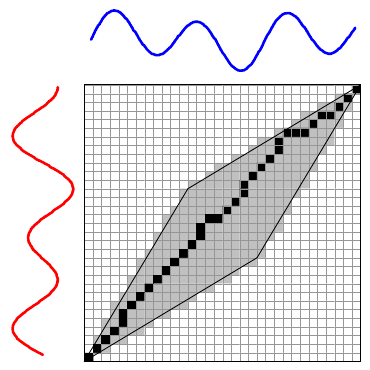 Notice that a single point in one time series can align with multiple points in the other. In this case, DTW gives a distance nearly zero—it is a nearly perfect match. Euclidean distance had a much worse match and would give a large distance. The orange series contain three humps, the green four, and the blue five. But the humps do not line up, so this is a difficult problem for straight Euclidean distance. In contrast, DTW successfully clustered the time series based on the number of humps they have. That’s great, but how did DTW decide which points in the red and blue time series should align? 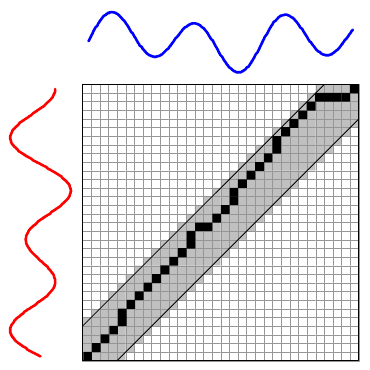 The colored boxes correspond to the colored lines connecting the two time series in the first image. For example, the four light blue squares in the top right are on a single row, so they map one point on the red series to four points on the blue one. Using dynamic programming, DTW is an $O(N^2) $ algorithm, which is much slower than Euclidean distance’s \(O(N)\). This is a serious problem if we want to use the algorithm to search a large database. The easiest way to speed up the algorithm is to calculate only a small fraction of the matrix. Intuitively, we want our warping path to stay relatively close to a diagonal line. 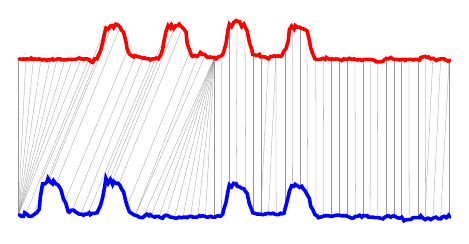 If it stays exactly on the diagonal line, then every red and blue time correspond exactly. This is the same as the Euclidean distance. At the opposite extreme would be a path that follows the left most, then top most edges. In this case we are comparing the first blue value to all red values and the last red value to all blue values. This seems unlikely to make a good match. The basic ideas behind these restrictions is pretty straightforward from their pictures. What isn’t straightforward, however, is that these techniques also increase DTW’s accuracy. For over a decade researchers tried to find ways to increase the amount of the matrix they could search because they falsely believed that this would lead to more accurate results. We can also speed up the calculation using an approximation function called a lower bound. A lower bound is computationally much cheaper than the full DTW function—a good one might run 1000 times faster than the time of the full DTW—and is always less than or equal to the real DTW. We can run the lower bound on millions of images, and only select the potentially closest matches to run the full DTW algorithm on. Two good lower bounds are LB_Improved  and LB_Keogh . Finally, there are other methods for comparing time series. The most common is called Longest Common Sub-Sequence (LCSS). It is useful for matching images suffering from occlusion . Time series analysis is only sensitive to an object’s shape. It is invariant to colors and internal features. These properties make time series analysis good for comparing rigid objects, such as skulls, leaves, and handwriting. These shapes do not change over time, so they will have similar time series no matter when they are measured. Time series analysis will not work on objects that can change their shapes over time. People are good examples of this, because we have many different postures. We can walk, sit, or curl into a ball. Another distance measure called “shock graphs” is better for comparing the shapes of objects that can move. We’ll cover shock graphs in a later post. Yazdani, Meral Özsoyoglu. 1996 Sequence matching of images. In Proc. 8th Int. Conf. Sci. Stat. Database Manag. pp. 53–62.